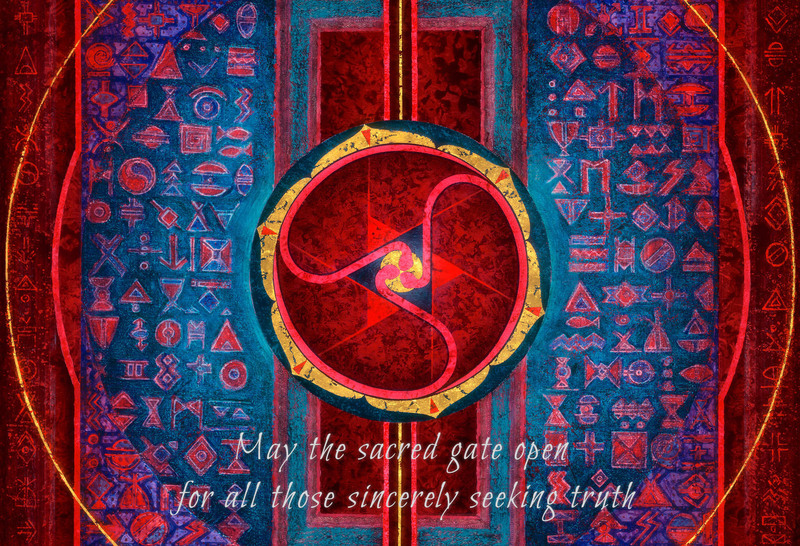 This painting shows the sacred gate, which opens to the spiritual dimension. 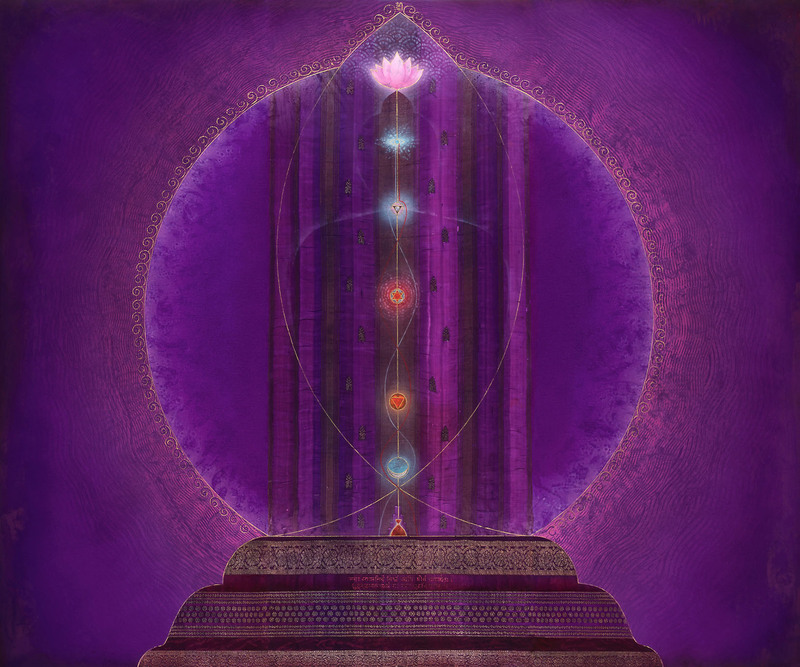 The two gate panels represent the male and female energies. On the canvas, these complementary aspects are connected by a golden circle. 'Tattvamasi' or 'Tat Tvam Asi' is one of the Grand Pronouncements in Vedantic Sanatana Dharma, meaning the Self is identical with the Ultimate Reality. Thou art That. 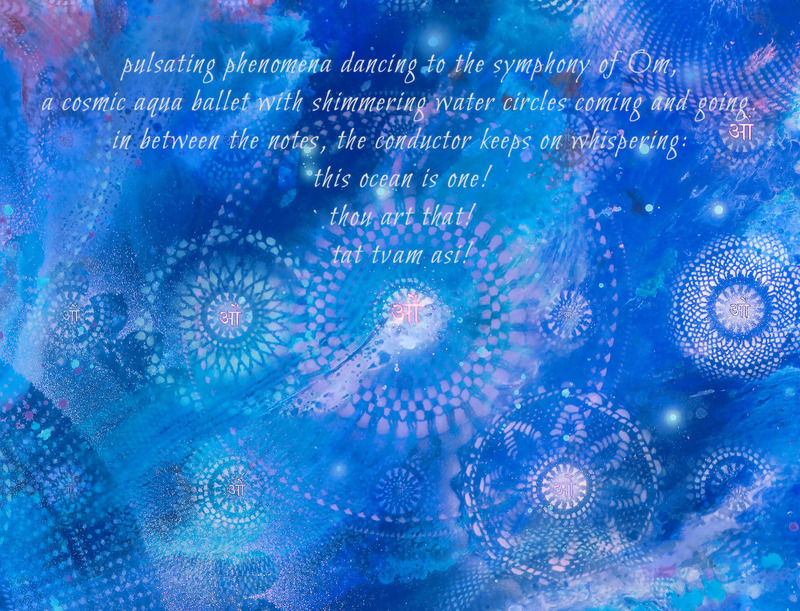 I created this painting by successively interweaving layers resembling a cosmos or an underwater world and layers which show Om signs. A precise matrix of 12 x 9 rows allocates the positions for a total of 108 Om syllables. 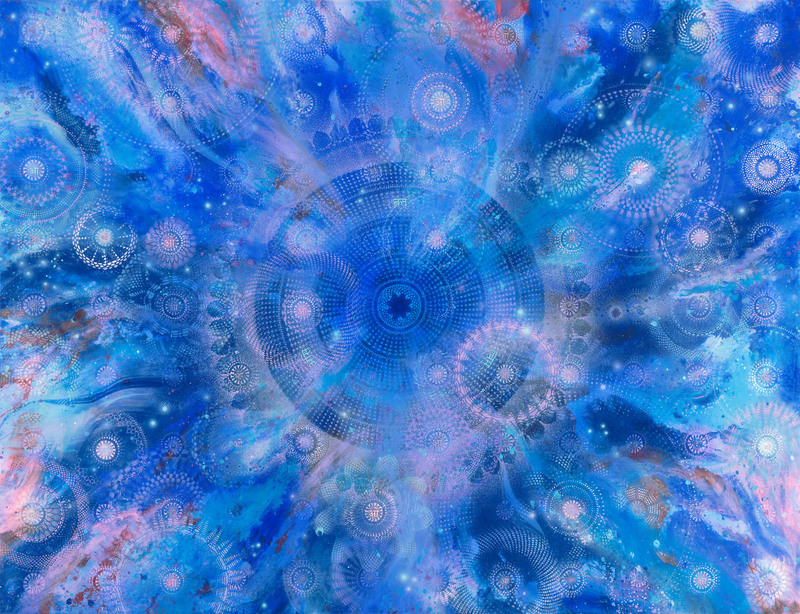 This sacred number was taken from eastern astrology and represents cosmic consciousness. The work conveys the realisation of Tattvamasi as a process whereby all boundaries created through the spell of identification become transparent and ultimately dissolve. While visiting some temple ruins in Western Tibet, I encountered a beautiful small clay Buddha inside an old temple hall. This small radiating statue energetically filled out the whole space which was once constructed to accommodate a very large Buddha statue which got destroyed. 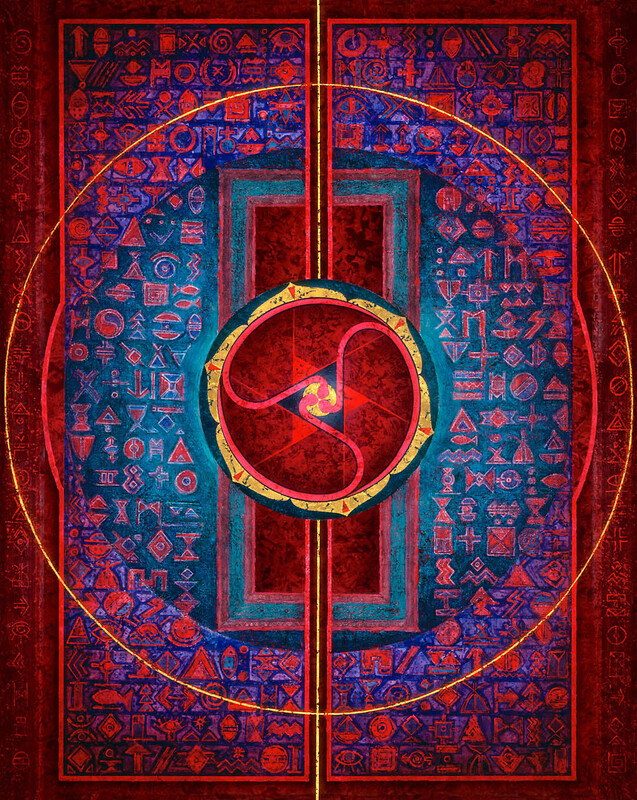 This became the inspiration for my painting, at the bottom of which a small red figure can be seen, as well as a faint outline evoking a much larger figure: a Buddha with a lotus flower at the top of his head, indicating the flowering of the seventh chakra. A decorative pattern consisiting of 108 tiny spirals embosses the Buddha's aura. We may perceive ourselves as trifle beings, but down the ages wise men and women have reminded us of our true spiritual nature. 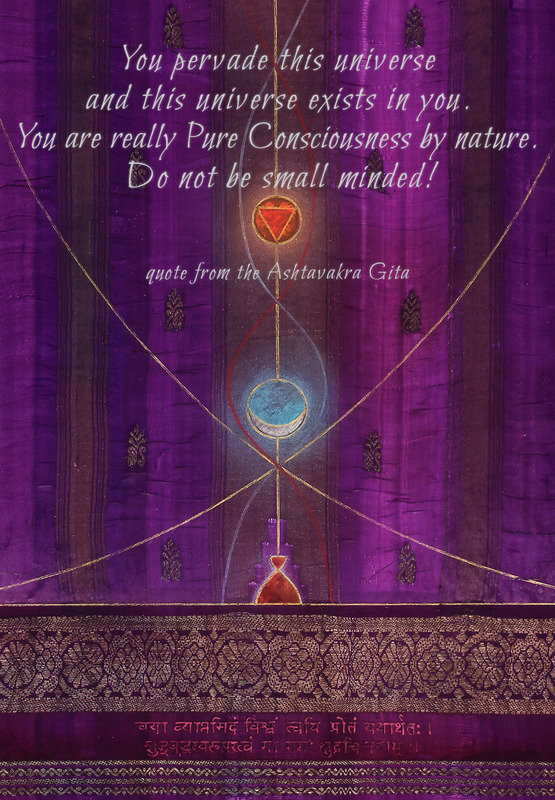 One of those enlightened guides was Ashtavakra (500-400 AD), whose words are part of the Advaita teachings. A quote from the Ashtavakra Samhita or Gita can be found at the bottom of the canvas.